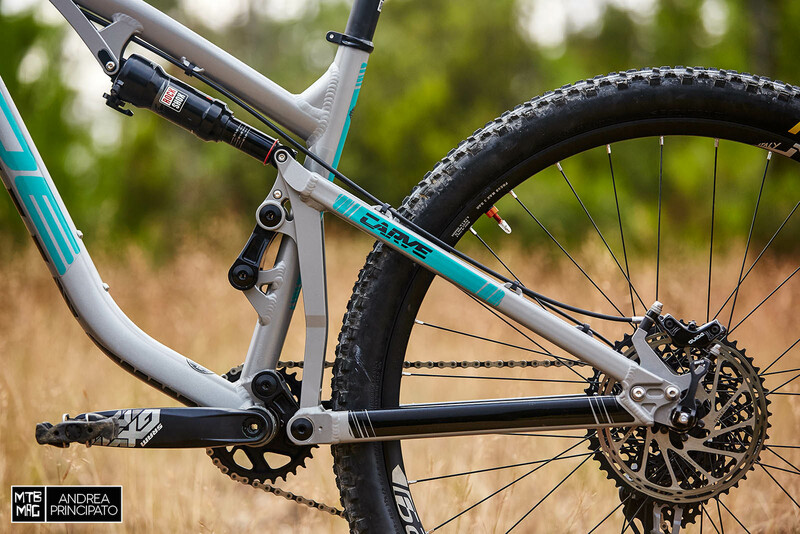 Just recently, MDE announced the Carve, a trail bike which allows the possibility of switching between 29” and 27.5” versions simply by replacing the swingarm dropouts. For some time, we’ve mainly been testing the 29” version of the Carve, and had just a few rides with 27.5” wheels to compare the two options. 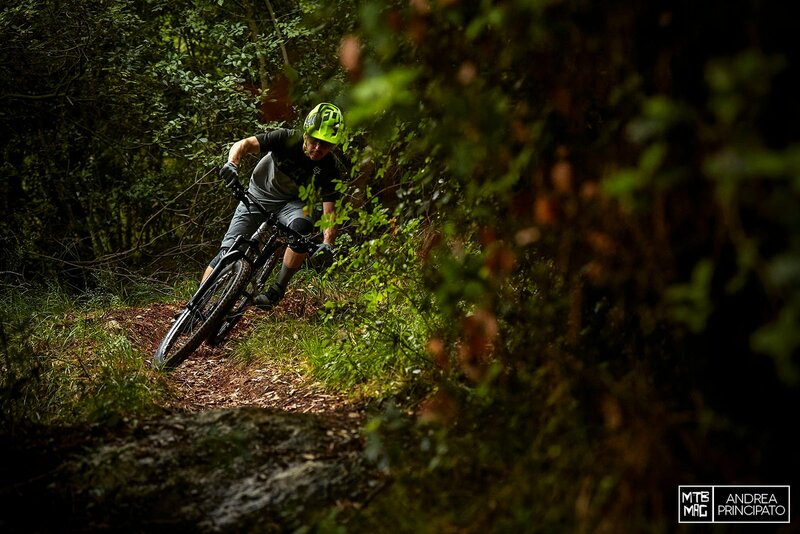 Apart from some days in different Ligurian trails, the test was mainly carried out along high altitude alpine trails, where the Carve seemed to shine – on terrain with huge differences in height and various types of terrain and conditions. Sticking to the MDE tradition, the Carve is fully made of aluminum, with hydroformed tubes cut and welded in Italy from 7005 T6 alloy. The care dedicated to welding and CNC parts have always been a key strength of the Turinese brand, together with the efficient i-Link suspension system. It is MDE’s specific interpretation of a virtual pivot system. In this case, the shock is directly compressed by the rear swingarm, the rear end is guided by two short links almost perpendicular to each other. In this way MDE generates a highly progressive compression rate, with optimal antisquat management, which allows you to use the shock always in the Open position and still maintain pedaling efficiency. 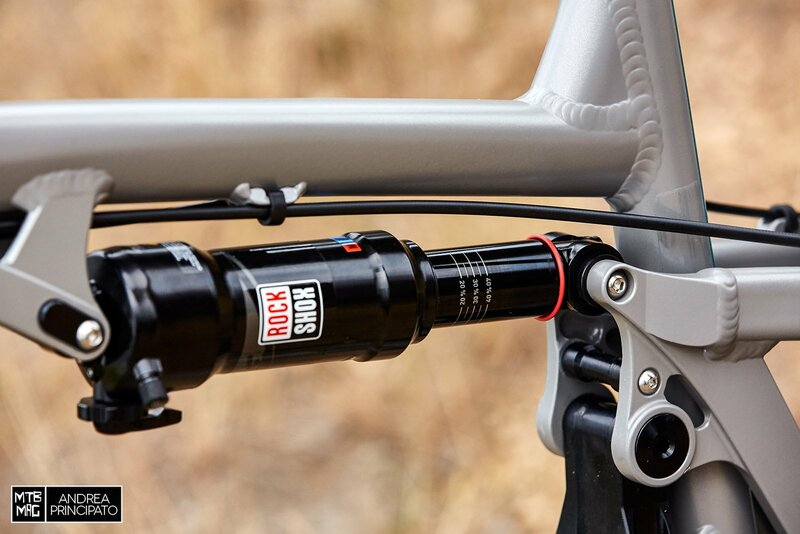 The very high position of the shock also affords loads of clearance for the bottle cage, which can support even larger bottles. During this extremely hot summer we were really happy to be able to carry a 750ml bottle. The big news on the Carve is for sure the FAST System. MDE officially explained the name as the acronym for Fit All Standards Technology… but on the decal is written a meaningful “F** All Standard Technology”, a clear opposition to the great number of new standards which both manufacturers and riders have to cope with. 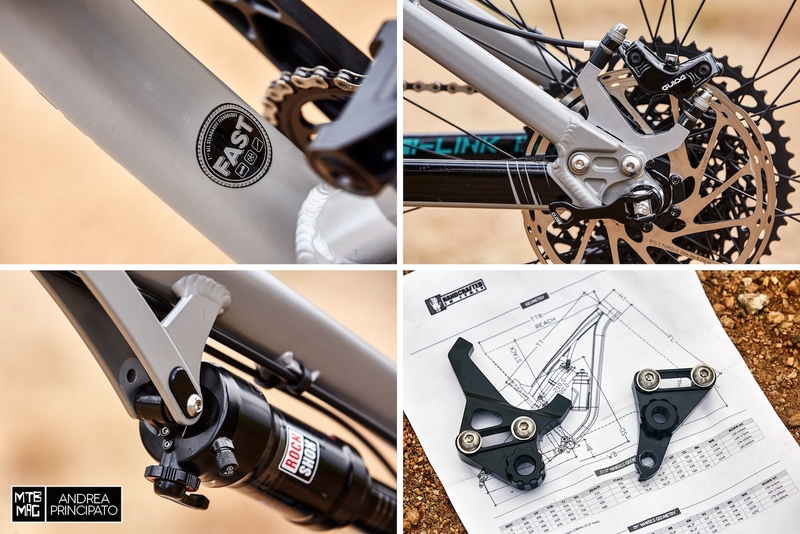 FAST technology enables you to quickly replace the swingarm dropouts, with just four screws. This way, the same frame can support both Boost 148mm and 142×12 hubs, 27.5” wheels or, thanks to the 14mm longer dropouts, 29” wheels. Furthermore, thanks to a specific mount to be fixed to the four holes on the frame, it is possible to install traditional shocks (200×57) instead of the spec’d metric one (210×55). With the FAST system, geometry chart is divided into two fields: a 27.5” option and a 29” option, which basically differ from each other by a few numbers. Obviously the chainstay length increases by 14mm due to the longer dropouts on the 29” option. The wheelbase length of course increases by 14mm as well, but it gets even longer due to the greater 29” fork offset, for a total amount of 23mm. The most affected number is the bottom bracket height: it becomes 19mm higher, we measured it at 353mm while the declared number was 350. Angles and some other measurements are not involved since the 29” fork has the same A2C height of the 150mm fork installed on the 27.5” build. 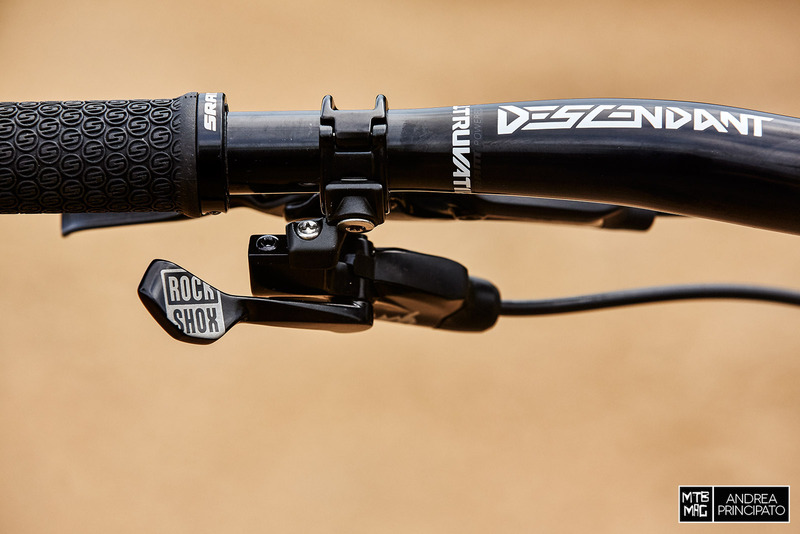 The standard shock installed on the Carve is a RockShox Deluxe RT Debonair with 210mm eye to eye and 55mm of travel. It is linked to the swingarm by sealed ball bearings instead of DU bushing to minimize the friction and enhance the sensitivity of the whole suspension. 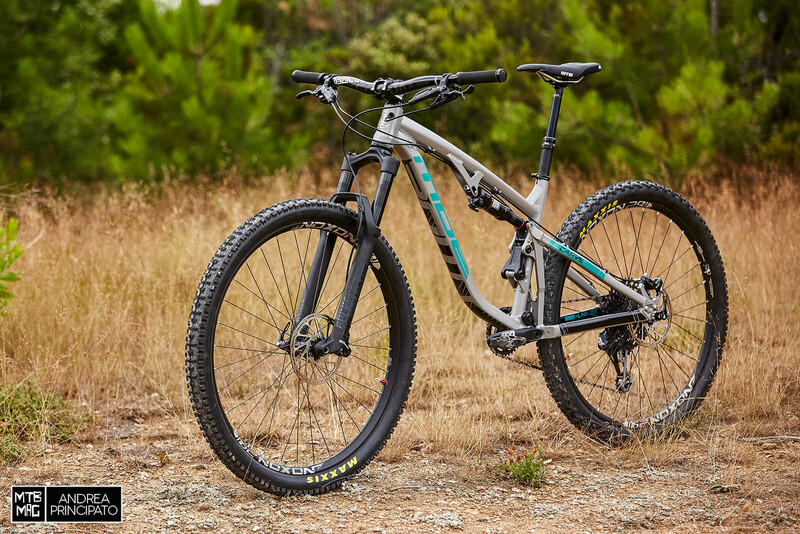 The new Carve features a 2018 RockShox Pike RCT3. 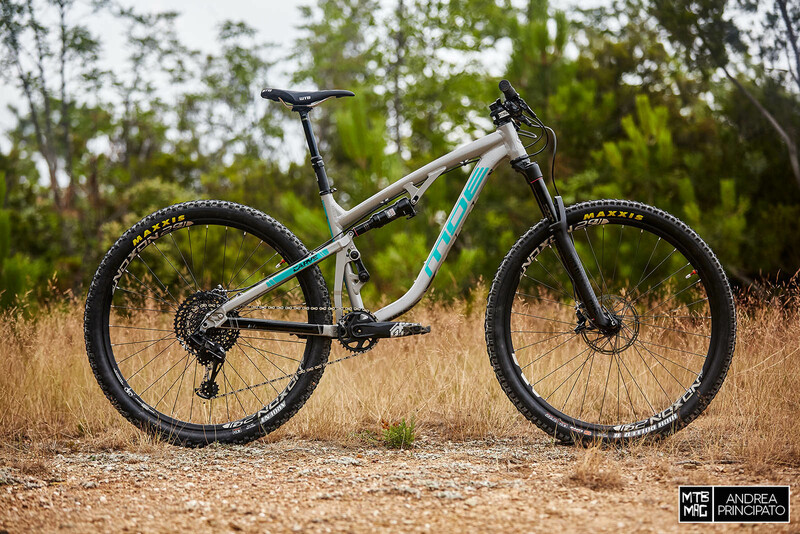 On the 29” spec, the Pike has 140mm of travel and a 51mm offset, while in the 27.5” specs the travel is 150mm with a standard 42mm offset. A 46mm offset version of the Pike on the 29” specs would have been more versatile for those who want to use both wheel formats on the same bike, using the same fork. 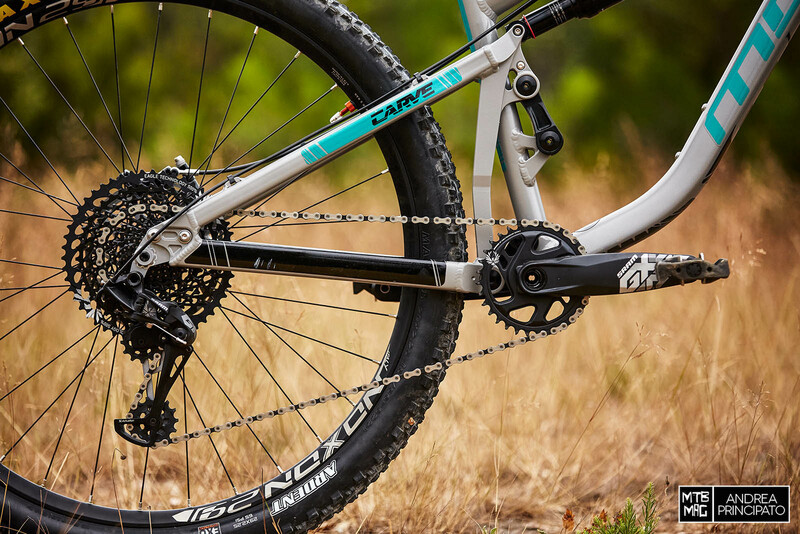 The drivetrain is also from the SRAM camp, a 12speed Eagle version of the GX group, precise and reliable. The Eagle Direct Mount chainring has 32 teeth and combined with the 10-50 12speed cassette offers a good range of gear ratio especially for the 29” version, while on the 27.5” it would be favorable to mount a 34t chainring, due to the smaller diameter wheels. The stock wheels are made in Italy. 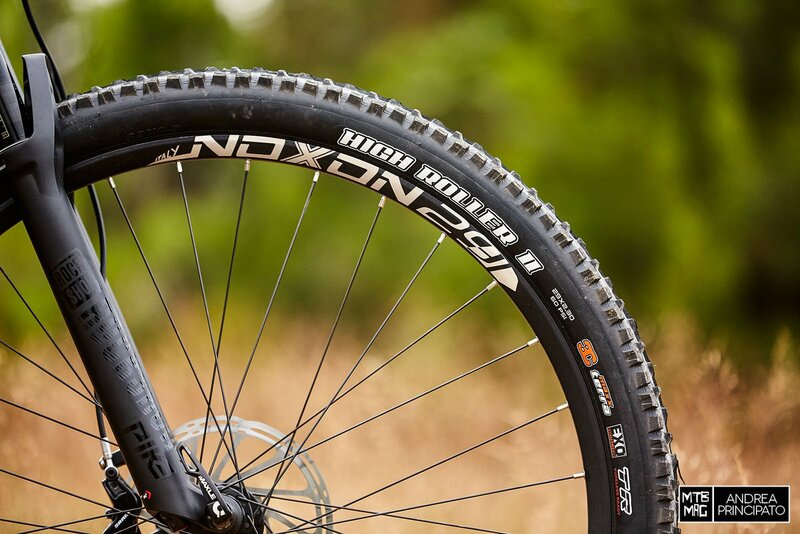 A Noxon Terra wheelset comes on both versions, 27.5″ and 29″. The new Noxon wheelset is fitted with rims made by the Italian company DRC, with a 25mm inner diameter and a 19mm deep asymmetric profile. They are provided with tape and tubeless valves. Noxon Extreme hubs have oversize bearings, which we were already familiar with and appreciated their smooth, reliable nature. MDE chose Maxxis tires with EXO and a Tubeless Ready casing: a High Roller II 2.30” with 3C compound at the front and an Ardent 2.25” with 60a compound at the rear. 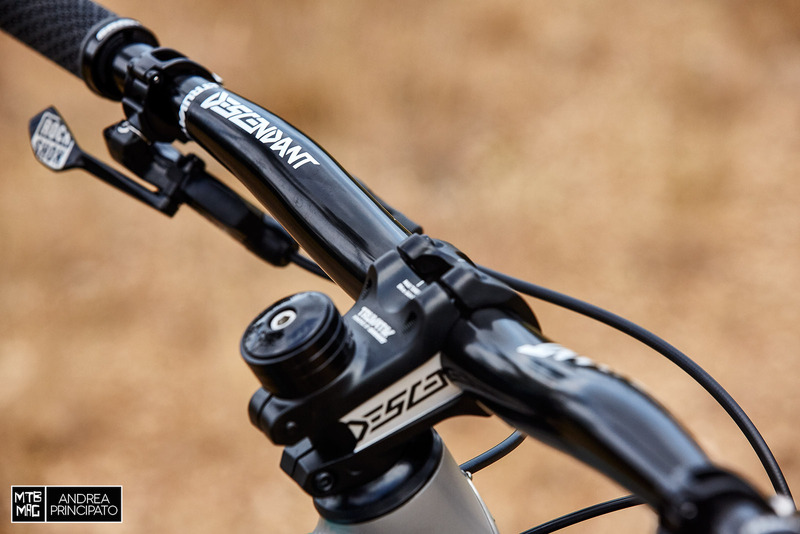 The handlebar and stem are Descendant by Truvativ. The former has the same shape of the previous Boobar, is 760mm wide and has a 20mm rise. The latter is 50mm long with 0° rise. A bar with lower rise and/or a negative rise stem would decrease the bar height from the ground, which is definitely high, since the long head tube and the external headset increase the stack. The 1x remote of the RockShox Reverb Stealth dropper seatpost is very interesting and handy. It has an hydraulic operation but its shape and actuation resemble that of a classic derailleur trigger. The Reverb on the stock Carve offers 150mm of travel, while the one on our test bike has only 125mm of travel. We write “only” because it usually would be enough on a Trail bike, but in the case of the 29” version of the Carve, due to the very high stack, we often would have liked to lower the seat more. We were genuinely excited to ride an aggressive Trail bike in this part of summer, in the second half of July, when the snow had almost completely melted and it was possible to enjoy those trails which you can’t even dream of during the rest of the year. When we first touched the Carve 29, though, we were quite shocked about the weight: 13,6kg is not excessive, but it’s not super light either, considering the target of use. Is it the right bike to pedal, push and carry on shoulders at high altitudes? Much to our surprise, it is! While pedaling, weight was not an issue at all, thanks to good geometry, a very well thought out suspension system and a fast rolling and relatively light wheelset. 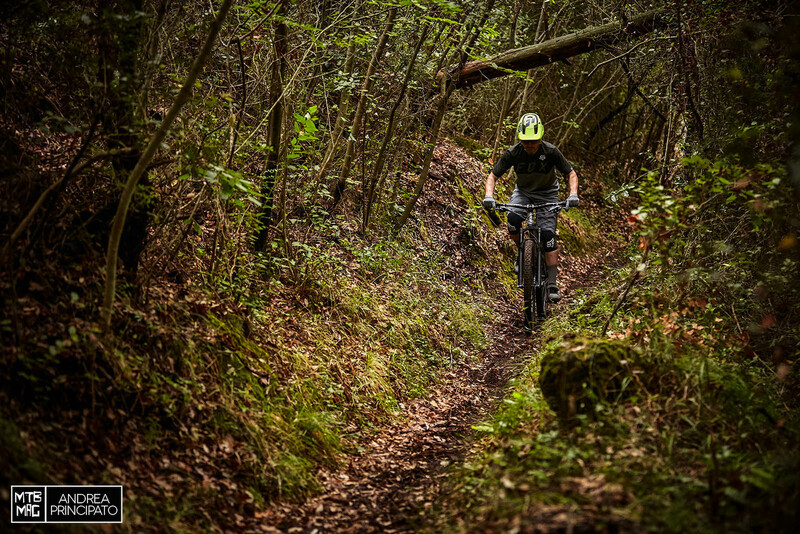 The Carve performs well on long and meandering climbs, where you can easily cover a lot of altitude. The seated position is peculiar, since you are pretty vertical due to the steep seat angle, which we liked a lot, and the handlebar height from the ground. Nonetheless – you feel well balanced and in control of the front end, which sticks to the ground and is easy to handle. This is noticeable especially on technical and steep sections, where the Carve is extremely smooth thanks to the precise steering up front, and the back, which never lost traction. In fact the highly progressive suspension system is sensitive to small bumps, but at the same time allows the shock to work substantially well, without diving in the early parts of the travel. For this reason, the suspension behavior is intuitive, with plenty of traction while still carrying speed nicely over successive obstacles. It’s worth highlighting that the antisquat value is perfectly calibrated and the suspension is amazingly stable while pedaling, even in the Open position. In fact we never locked out the suspension apart from a few times on pavement. In the technical sections we opted to leave the shock fully open, so we could completely concentrate on the riding and have fun. 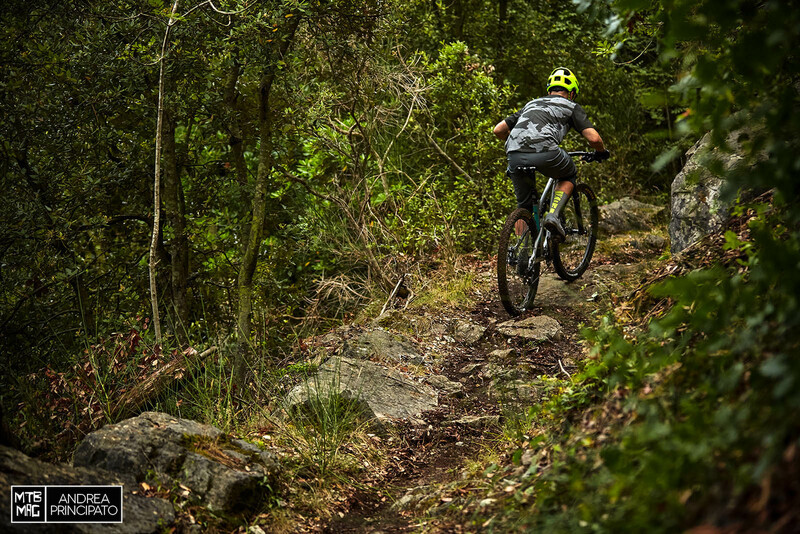 The centered and aggressive riding position is admirable once you point the bike downhill. You don’t experience the classic 29er sensation of being “inside” the bike, though, because of its general height. This is why the bike – despite being versative – is not always very fast in changes of direction: you need to lower your body to gain stability when cornering, lower your center of mass as much as possible to improve it’s nimbleness. On the other side, the chainstay length provides optimal stability in corners, especially fast corners. On the most rough and harsh sections, the Carve absorbs bumps really nicely due in part to a very dialed suspension system and rate, which makes the shock compliant in the early stroke, then providing good support. This is the result of the highly progressive compression rate. The bike sticks to the ground firmly but it’s still responsive enough to get the wheels up when needed. 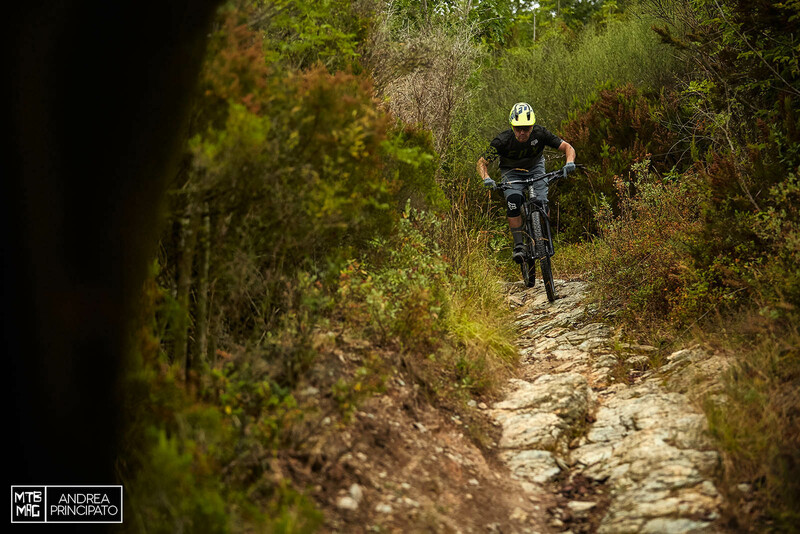 As the track gets more technical and steep and the speed decreases, the Carve was reliable and precise, with very good maneuverability, allowing us to face trials-like sections with confidence. In these situations, the high progressivity of the shock makes the Carve a bit nervous, but this can be translated as offering more responsiveness, a little bit to the detriment of stability that was due to the height from the ground. We carried out a small part of the test with 27.5” wheels, as already said in the introduction, to better understand the behavior of the Carve, taking advantage of the chance to switch wheel format by simply replacing the swingarm dropouts and, obviously, the wheels. The result is not a perfect copy of the standard 27.5” version, since the fork is still a 140mm 29” with 51mm offset instead of 42mm like the 27.5” Pike with 150mm of travel, which is the standard one chosen by MDE for the 27.5” model. The difference of travel is not critical and the A2C height is the same, so geometry doesn’t change. The offset measurement, though, affects steering responsiveness. This is why we suggest to those who want to use both the wheel diameters on the same bike, to get a 46mm offset fork. 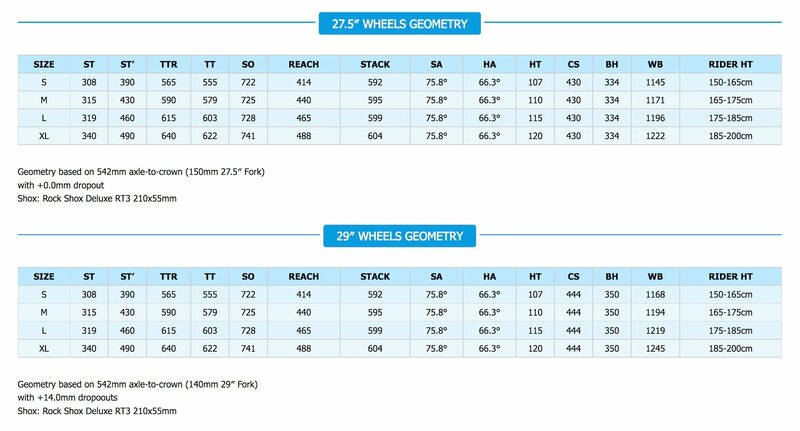 Not considering the differences due to the wheels diameter, which we all well know, the most critical thing is the drastic change of some measures like the bottom bracket height (it’s best to say the overall bike height) and the chainstay length. The 14mm shorter chainstay and, consequently, the shorter wheelbase, make the Carve much more nimble and easy to turn, also thanks to the lower cockpit and bottom bracket, which strongly enhance agility and and speed of directional changes. 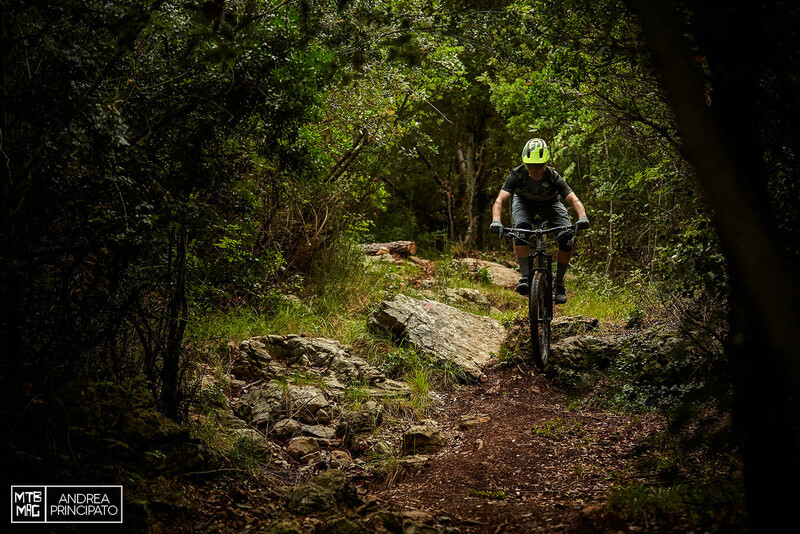 The Carve is an aggressive and peculiar Trail bike, which is fun to ride on a wide range of terrains, from classic Trail bike use to fast and aggressive Enduro descents. 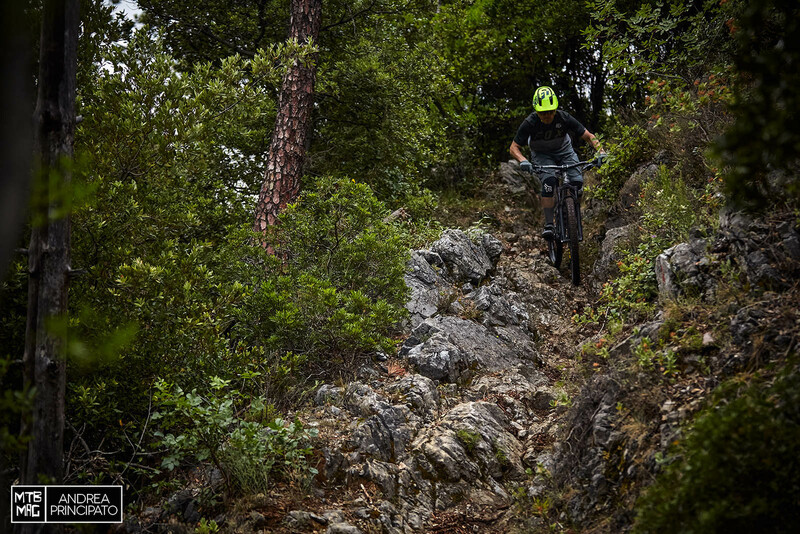 The bike performs at its best in its natural habitat, high up in the mountains on natural alpine trails, which are often often difficult and demanding. The obvious question is: 27.5” or 29”? The geometry plays nice with the 27.5” version, however the 29” wheels are more in line with the character and the target use of the Carve. The new Carve is now available. It comes in one single build, called Race, at the price of €3.899, both for the 29” and the 27.5” version. The frameset is also available at €1.739. With the Rider Tuned Geometry program it is possible to adjust geometry when placing the order. There is a wide range of paint and decals colors to choose from and customize.